Fracking stock plays that stand to earn big rewards are explained and described by Absolute Wealth's Special Report, "Sideways Oil." Absolute Wealth consulted energy industry analysts, stock and income experts, and oil specialists to compile the biggest collection of information on fracking, and then condensed it down to a quick, easy-to-understand e-book full of useful advice. Fracking stock plays that hold the most potential for impressive earnings are becoming more attractive by the day, said today’s AbsoluteWealth.com article. Fracking, or hydraulic fracturing, is breathing new life into the American oil industry. It’s also producing some growing companies that aren’t just doing the drilling, but also supplying the industry with equipment and waste treatment, as well as providing other supporting roles. Each one of these companies finds itself in the middle of a potentially world-changing innovation, and the online article said that means investing in them is going to be a wild ride. 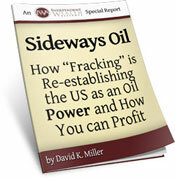 Thankfully, Absolute Wealth is offering some help with their Special Report entitled “Sideways Oil: How “Fracking” is Re-Establishing the U.S. as an Oil Power and How You Can Profit.” It’s full of insider information about the rise of fracking, its impact on the oil industry, and its potential for serious profit opportunity. The article said the Special Report will show people how to make money in oil, the new-fashioned way. Absolute Wealth consulted energy industry analysts, stock and income experts, and oil specialists to compile the biggest collection of information on fracking, and then condensed it down to a quick, easy-to-understand e-book full of useful advice. That way, investors can easily act upon the major stock plays outlined in the Special Report. The article said to think of it as Absolute Wealth’s way of recognizing a trend and addressing it with not only facts, but with recommendations that are connected to America’s energy industry and its exploding potential. While not without controversy (because of supposed environmental impact), fracking is proving itself as a viable economic springboard, said the article. “Sideways Oil” doesn’t deny the accusations of fracking and its environmental impact, but also provides proof that concerns may be unfounded and uncalled-for. It shows how the positives far outweigh the negatives, and the companies that know that are proving it with their growing business and never-before-seen oil production. Absolute Wealth continues to do what they’re best at with “Sideways Oil,” and hopes to help as many investors as possible with the release of the Special Report. It’s providing information of the wisest fracking stock plays, and is helping traders tap into the changing atmosphere of the world’s oil economy.